The world enters 2012 amid growing anxiety that the lingering effects of the financial crisis that engulfed the global economy in 2008 will erupt into yet another crisis, possibly with more profound effects than the Great Recession three years ago. At the center of the uncertainty are Europe and the United States, with the former struggling to contain a banking and sovereign debt crisis that threatens to unravel the euro zone, while the latter is paralyzed by a toxic policy struggle over whether to stimulate the economy further or focus on slashing the federal budget deficit despite weak economic growth. Much is at stake for Asia in the outcome of Europe and America’s policy choices. This is not only because demand from these economies underpins much of Asia’s export growth, but also because another collapse of Western markets and financial systems would inevitably shake those in Asia. It is not enough for Asian policy makers to point to relatively robust growth here, even during the 2008 crisis, as a reason to stand back from what could become a much more serious problem for the world economy this time around. What should be done? 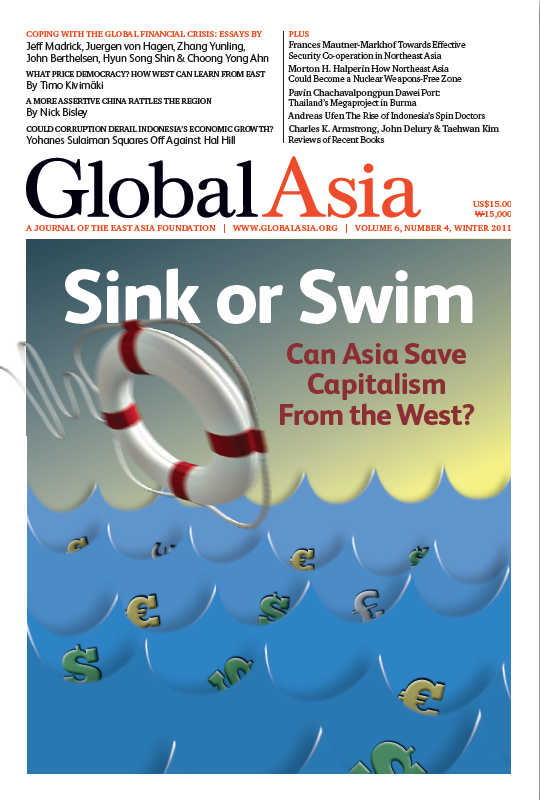 And what can Asia do to help the global economy recover? The articles in our cover package explore a variety of options. For starters, Asia can hold up its own financial crisis of 1997-98 as an example of what Europe and America should do — namely, shore up collapsing demand and credit contraction first, before tackling the need for longer-term austerity in public- and private-sector finances. Getting the sequence wrong could make things worse, not better, as Asia learned back then. Asian economies, especially China, could also do more to stimulate domestic demand, providing a destination for exports from the rest of the world, especially Europe and the United States. Longer-term, the stability of the global economy and financial system will require a greater voice on the part of Asia’s emerging economies in the institutions that shape global governance, including the IMF and the World Bank. So far, progress on this front has been slow. The problems facing Europe and the United States are a reminder that Asian policy makers must assume greater responsibility for global governance, if for no other reason than to save global capitalism from the West by reshaping it with Asian characteristics. In doing so, this economic system, long dominated by Western free-market orthodoxy, could become more balanced, to the long-term benefit of both East and West. The economic uncertainties that continue to grip the world over how the US and Europe will resolve their respective financial crises are front and center in the minds of policy makers worldwide. Here in Asia there is much that could be done to assist the global recovery. When the US financial crisis triggered the Great Recession that afflicted much of the world in 2008-2009, policy makers in the US and elsewhere clearly understood that their economies needed massive stimulus measures, and fast. Even as the 17 European Union countries that use the euro agreed at a summit in Brussels in December, uncertainty persists about whether Europe is finally on a road to recovery from its debt crisis. China stands out as a silver lining in the clouds that hang over the global economy, and there is much the country can do to assist a recovery in the US and Europe, such as stimulating demand in its domestic economy. Will Chinese Consumers Come to the West’s Rescue? China's surging growth and huge domestic market have long fueled dreams that once its consumers are unleashed rising demand will help heal ailing Western economies. As Europe continues to reel from its financial crisis, policy-makers there would do well to cast an eye on the Asian financial crisis of 1997-1998 and other emerging market crises to avoid the pursuit of remedies that will only make things worse. Can Asia Save the Sinking World Economy? While Asia's leading economies have been largely immune from the current European economic crisis, the long-term prospects are perilous unless the region uses its strength to assist the global economy. Could Corruption Derail Indonesia’s Economic Growth? The key is only allowing the ‘right’ sort of corruption: Small bribes that oil the wheels of commerce for everyone are less of a problem than high-profile scandals involving officials pocketing millions of dollars. As a developing country riddled with corruption at every level, Indonesia appears to defy expectations with consistently high growth rates in recent years. It is taken as orthodoxy in much of the democratic West that intrusive efforts to promote democracy, up to and including armed intervention of the kind seen recently in NATO's support of the Libyan uprising, are means justified by the ends. China's newfound assertiveness, particularly in its maritime disputes with its neighbors, has disturbed the region and reawakened US attention to a part of the world it had largely been neglecting. Despite its potential for conflict rooted in historical grievances, Northeast Asia lags far behind Europe in developing multilateral systems to ensure effective regional security co-operation. As the Six-Party talks aimed at eliminating North Korea's nuclear program remain stalled, a fresh approach incorporating the concept of a nuclear weapons-free zone in Northeast Asia should be considered as a way to ensure peace and security in the region. Nuclear energy, long a contentious issue in Taiwanese politics, has been catapulted into the spotlight by upcoming presidential elections and the nuclear disaster at Fukushima in March 2011. If the political process under way in Burma genuinely heralds the end of the country’s long torpor under military rule, the opening of the economy is a key factor. One by-product of democracy over the last dozen years in Indonesia has been the creation of a political polling and consulting industry. Thirty-two years after his death, Park Chung Hee (1917"“1979) is currently the most revered former president in the history of South Korea. Park's popularity is largely a posthumous phenomenon.